This blog post responds to the many inaccuracies in the ADL’s response to our Deadly Exchange Day of Action on November 8th. I am the JVP representative who ADL Communications Director Betsaida Alcantara references in the organization’s response to our action. I am not JVP staff, I’m a volunteer leader in the JVP-NYC chapter. 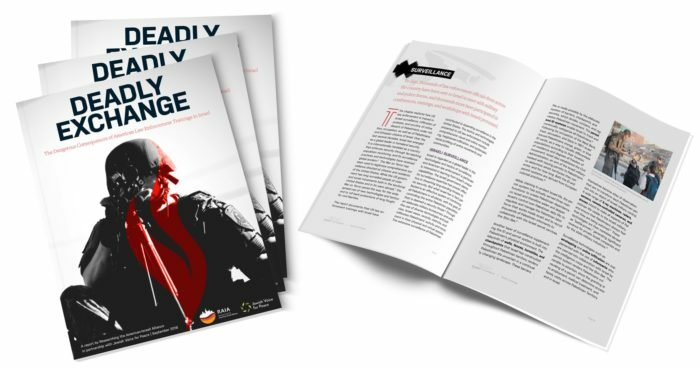 I got involved in the Deadly Exchange Campaign because I am a long-time participant in, and student of, the international prison abolition movement. I’ve been extremely lucky to sit at the feet of, and fight alongside, community leaders in anti-prison movements in California and the immigrant justice movement in Arizona. These broad, powerful movements are led by the people most impacted by racial state violence: black, brown, indigenous, and working-poor people. These movements demonstrate the necessity of radical solidarity across many kinds of difference, to organize for justice for “all of us or none.” To me, as a student of these movements, this ethic means two things. First, it means that our movements for justice against racial capitalism need to prioritize the needs and demands of the most impacted people. Our movements cannot sacrifice the most vulnerable people in order to secure reforms for some. Second, it means that all of us–no matter our experience or identity–must find our commitment and meaningful contribution to these movements because we all need large scale transformation. It was because of those commitments that I was so moved to be a part of the Day of Action for the campaign on November 8th. 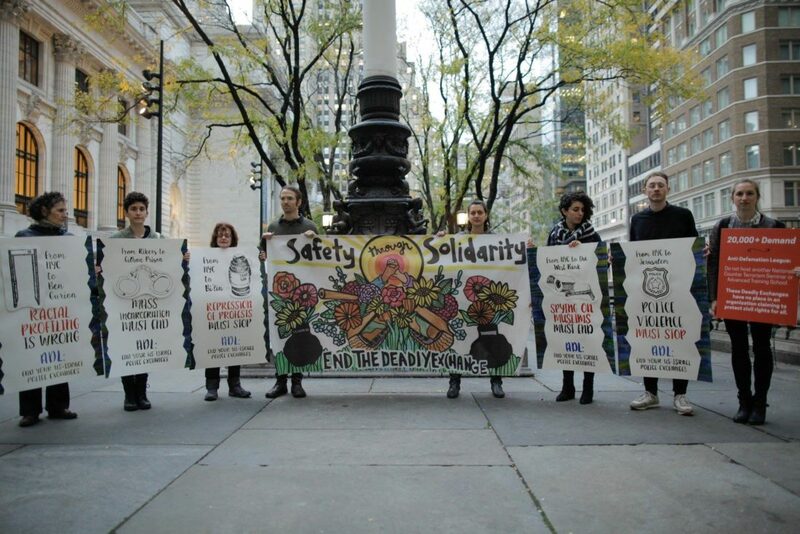 It was thrilling to watch as my fellow JVP members and our partners demonstrated at Anti-Defamation League offices from St Louis to Seattle, New Haven to Chicago, and 11 other cities across the country, calling on the ADL to end #DeadlyExchange programs between U.S. and Israeli law enforcement officials. Just like in the letter that JVP ED Rebecca Vilkomerson delivered to ADL Director Jonathan Greenblatt that morning, asking for a meeting to discuss our demands, the ADL heard from us–coast to coast, hour on hour. And our request was simple: that ADL staff, particularly those responsible for their policing programs, stop, listen, and really hear the harms of their Deadly Exchange. In the lobby of their NYC headquarters that night, 100 of us New Yorkers asked the ADL to listen. We shared with heart and sincerity our deep concern for the violence inflicted by the NYPD, ICE, and the Israeli military and police. We read stories from Palestinians harmed by the very Israeli officials and policies the ADL holds up as a model. We said the Mourner’s Kaddish for all those lost at the hands of state violence. Rebecca Vilkomerson has still not heard back from Jonathan Greenblatt in response to our request for a meeting. But a week and a half after our action, the organization finally issued a response to the hundreds of us who took action and the 20,000+ people who’d signed our petition. Rather than address any of our serious concerns about the harms of their programs, harms we were endeavoring to communicate in the lobby of the ADL that night, the ADL’s response attempted to shift the focus away from what our actions collectively said, and instead onto a conversation I had in the wings with Ms. Alcantara. As the sole focus of their response, it’s especially telling that the encounter Ms. Alcantara describes bears little resemblance to the conversation that actually happened. I was co-emcee of the JVP action in New York, and was called over to have a conversation with Ms. Alcantara when she came to the lobby. We spoke several times, and throughout I checked in with others at JVP about those conversations because the interaction was not mine alone to navigate. While talking to Ms. Alcantara, I felt confident we managed a mutually respectful interaction in a tense situation. So when I read her description of our conversation, I was surprised and disappointed. This wasn’t the same conversation I participated in. Ms. Alcantara wrote in her opinion piece that I had assumed that, as a woman of color she must be “some junior person.” This simply isn’t the case. The first thing Ms. Alcantara did was introduce herself to me as the Director of Communications; I knew throughout our entire interaction and multiple conversations that she was senior leadership. After introducing ourselves, Ms. Alcantara told me that she had come downstairs to ask us to leave, and that if we did she would take our petition. I responded that we were not here to simply drop off the signatures; we were asking the ADL to listen to the full testimonies of people impacted by the police exchange programs and to engage in meaningful dialogue about ending these exchanges. I invited Ms. Alcantara to join our group and listen, and she declined; responding that she could hear well enough from where she was standing, far from the speakers as they shared testimonials of Palestinians directly harmed by their program. Throughout our interaction, it was clear Ms. Alcantara’s singular focus was to get us to leave. She suggested that the 30-some police officers who eventually came to arrest our group of 7 protesters would be there at the behest of building security. I asked her multiple times to tell the building that we were there for the ADL, and to ask security to allow us to stay without calling the police. She said we were trying to twist the ADL’s hand into calling the police and I replied that we would be happy to end our protest once she or others agreed to listen to us in the lobby or invite us upstairs for a direct conversation about ending the exchanges. When we began talking about their policing programs, Ms. Alcantara shared with me that they were outside her scope of work. I described to her some of the harm mass incarceration and police exchange programs were causing the loved ones of many people gathered in the lobby; she expressed deep empathy and described her own lifelong commitment to social justice work including police reform. I absolutely did not, as she wrote, ask her “point blank how a woman of color could work for the ADL.” Rather, I expressed to her that my life and family have been impacted by the prison system and that personal experience grounds my commitment to this work; she told me her personal experience as an immigrant woman of color did the same for her. In response, I acknowledged that, because I am white, we have had different and uneven experiences of this system. I am certain of this distinction because Ms. Alcantara’s portrayal of our conversation contains the same sharp contradiction that I think the Deadly Exchange campaign helps to expose: our personal experiences fundamentally inform our commitments, but our identities do not determine our political ethics. People from marginalized communities can participate in the harm and oppression of other marginalized people. Jewish people can fight against anti-semitism and fight against Israeli apartheid at the same time. I think anyone can and everyone should. The ADL cannot hide behind being a rhetorical civil rights organization, while investing in the expansion of the NYPD and Israeli occupation. As our conversation continued, Ms. Alcantara told me again she was proud of the police training programs at the ADL precisely because they work with officers to train against racial bias. I argued that the US and Israeli institutions of policing and their wide, devastating community impacts are inherently racist. We disagreed. At the end of our back and forth, she said to me “I respect your commitment.” We shook hands, and I said, “I really respect your commitment too.” I believe she meant what she said; I absolutely did, and I still do. I support the campaign to end the Deadly Exchange because it centers the needs and demands of people in New York City, across the US, and in Palestine, whose daily lives and families have been torn apart by extensive policing in the name of counterterrorism and reform. This is not an extreme stance; it is an “all of us or none” ethic. Our purpose that evening was to put pressure on ADL executives until they agreed to listen to the demands of people who are harmed by the police exchange programs which they fund. Far from Ms. Alcantara’s cynical claim that we were there to “manufacture an arrest,” none of our members desired to go to jail. They were, however, bravely willing to put their bodies on the line in order to push the ADL to really listen to the harm they are causing. Unfortunately, not even these arrests have been enough to give the ADL pause, to get decision-makers like Greenblatt to listen. Just as Ms. Alcantara would not join our circle and hear the voices of those harmed by policing and Occupation, the institution as a whole is refusing to listen. Nothing seems to be enough to get their attention: not a petition signed by 20,000+ concerned individuals; not beautiful, coalitional actions at 15 of their offices; not 7 activists–ages 24 to 72–handcuffed and hauled away from their lobby. All of this, and their one article in response to our campaign contains only a singular paragraph about what, how or why they run their US-Israel law enforcement exchange program. It is not an accident that Ms. Alcantara’s response to our protest spent only 112 words describing or defending the Deadly Exchange and the entire rest of the piece re-writing our interaction. This is a strategy to deflect attention from the voices and demands of people who are suffering at the hands of the state agents that the ADL helps to train. These stories of harm and injustice directly contradict the stated mission of the ADL as a civil rights organization; and this contradiction will not be resolved until the ADL listens and responds to the people who must navigate–every day, in their homes and neighborhoods, and through the loss of their loved ones–the lethal, economic and social consequences of policing and Occupation. Learn more and join JVP’s Deadly Exchange campaign here.